The playoffs are all about doing what you need to do to win and move on. The JV Boys Basketball team did just that with its playoff opener last Thursday (2/20/14) in defeating Yeshiva Rambam in front of a spirited home crowd. Due to Mother Nature, it has been nearly 3 weeks since the JV boys hoopsters took the court against an opponent in competition (an exhibition scheduled with HAFTR was postponed and then cancelled and this contest with Rambam was delayed from the previous Thursday), and the offense certainly showed the ill effects of the layoff. Happily, the defense suffered no similar trouble. While the offense could not buy a basket, the defense did not miss a beat. It was nearly three minutes in before Kevin Haddad got the ball to go down for the Falcons, and all Rambam could muster was a put-back at the 3:00 minute mark. However, when coupled with a single free-throw, the Ravens had a 3-2 lead late in the 1st quarter. The Ravens then began to exploit their size advantage, garnering second and third chances on offense, getting a pair of rebound follows to extend their lead to 8-4. Flatbush was clearly out of synch, and burned two precious time outs in the hopes of righting the ship. But it looked to do just the trick, as the team came out more settled and patient on offense. With the clock running down, Louis Zarif took the ball and cut his way to the basket, dropping in a fluid lay-up as the buzzer sounded, closing the gap to 2 and giving the home team some much needed momentum. Period 2 started off like the opening one, with both teams very tight. Then the Falcons found a flicker from the “on” switch. Jackie Mishaan hit one of two from the line, and followed that up with a drive to the hoop giving the Falcons their first lead since early on. It also rekindled the defense, which went from solid to stifling! The pressure would lead to empty possessions and turnovers from the Raven offense. At the same time, the Falcons finally found the range with Joe Cayre and Jake Shalom each hitting a 3-pointer sandwiched around a smooth feed of David Dayan cutting down the lane for a deuce. In a flash, Flatbush moved out to a 17-12 advantage. And when fouls forced the effective Dayan to the bench, Joe Gindi and Yoel Goldberg seamlessly stepped in to maintain the even keel Flatbush found, and the teams went to the break with Flatbush enjoying a four-point advantage, 19-15. The second half opened with the Falcons looking to take command behind a power drive to the hoop from Mishaan, drawing in the defense so he could slip the ball to Albert Richter for the finish. It was so good, that they did it again – wash, rinse, repeat – and just like that Flatbush has a near double-digit lead. The Falcons looked to deliver the knockout blow, but the officials had other ideas. Flatbush began amassing fouls at an alarming rate, and committed team foul number 7 before the 3rd period was even over. The Ravens closed the gap 24-21 and looked to have all the momentum, until reserve forward Yoel Goldberg stepped up and drained a mid-range jumper to stem the tide, re-establish a calm amongst the offense and give the Falcons a five-point lead heading into the final period of regulation play. Flatbush opened with an empty possession, but the rebounding returned with Mishaan and Dayan crashing the boards. Kevin Haddad soon followed with a 3-point bomb giving the Falcons a seven point lead two minutes in. But again, the shooting touch disappeared, and four Flatbush fouls led to four Raven points. Thanks to Rambam’s shooting at 50% efficiency from the charity stripe, the Falcons maintained a meager 3-point lead. A Flatbush fast break led to a Dayan free throw (matching the Ravens’ shooting percentage from the foul line), but a sputtering offense would be all Flatbush would need. The defense took control, generating turnovers and pulling down rebounds. And, with two minutes to play, it was “Cincinnati Weave” time! Looking to kill the clock, the Ravens needed to foul repeatedly. But having finally collected their 6th team foul and ready to send the Falcons to the line with the next one, the Raven guards lost track of Elliot Beyda who streaked with the inbounds pass to the basket for the uncontested lay-in, a 6-point Faclon lead and 1:30 left before the celebrating! With two pairs of free thows from Louis Zarif and Jackie Mishaan closing out the scoring, the Flatbush JV’s finished with a 35-26 win that belied the closeness of the game play. But this is the playoffs, and the name of the game is to win and move on, and on this night the JV Falcons did just that! Early this month, students from our AP Biology class had the opportunity to take part in hands-on-learning at a DNA lab. As part of the college laboratories that the AP Biology classes perform, the classes go to the DNA Learning Center in Harlem. There they perform a restriction enzyme lab. The objectives of the lab are to learn and understand all the theory involved in what restriction enzymes do and what they are as well as to learn the techniques used and the reasons for each procedure. Students became proficient at working with micropipettes, gel electrophoresis, hot water baths, micro-centrifuges and how to interpret their gels. On the night where the Flatbush fans came out to honor and support the graduating Senior student-athletes of the Falcon Varsity Boys Hockey program on February 18, 2014, it was the impact of a total team effort that carried the home team to victory over a game but overmatched opponent from the yeshiva hockey hotbed of Long Island. After a nearly two-month long lay-off from game competition, both the coaches and the fans were not certain how the team would play in the opening round of the win-or-go-home playoff format. Add to that that the team would be without the services of two key regulars, including Senior goalie Stephen Esses (who had played every minute of every Varsity game this season), what the Falcons would bring to the table was very much a big question mark prior to the drop of the puck. But the pre-game ceremonies recognizing each graduating Senior, followed by the introductions of the two starting line-ups for both teams and the obligatory playing of the national anthems of the USA & Israel, served to provide an added jolt of energy to the home team and their faithful fans that lined the upper gallery. The home team clearly fed off the crowd energy and showed from the start that they were ready to play, and had come to the Falcon’s Nest with their “A” game in hand. Three things were evident from the initial minutes of play: the Falcon defenders were intent on keeping the puck deep in the Hurricane zone, the Falcon offense planned on peppering the HANC goal with shots from everywhere and anywhere, and the HANC goalie was up for anything Flatbush looked to throw his way. That the game would be physical was clear from the get-go and that the officials would call the game tight was equally clear as only a few moments into the game the men in the zebra shirts whistled both teams for a double minor for excessive extra-curricular contact (read: a near fight). But whether playing 3-on-3 or at even strength, the Falcons set out to bring the game to the Hurricane defense, and expert passing created a wealth of scoring opportunities. Only the outstanding play of the HANC backstop prevented the Falcons from registering an early TKO. For more than one-half of the opening period, HANC’s goalie was equal to the task of stopping the potent Falcon offense. But with 7 minutes gone in the opening period, the Falcons finally got one past the opposition as second line center Ben Vilinsky took a centering pass and deposited the puck cleanly in the back of the net breaking the stalemate. Playing even the rest of the period, the Falcons took the 1-0 lead into the first break. The second period was all about the man advantage. The stanza began with a Hurricane in the penalty box (a carry-over from the end of Period 1) and ended with a Falcon in the opposing box. And in between, the lone goal of the period was recorded on the power play. Coming off a stonewalling of the Falcons man advantage at the start, HANC upped the offensive pressure and sustained it for the first time in the match. But Flatbush Junior goalie Elliot Zakay played big! In his first action in the pipes all season, Zakay was not as flashy as his Hurricane counterpart, but he was everything the Falcons needed him to be. With solid defense all night from Moe Maleh, Michael Tawil, Sol Sasson, Abie Cohen and Marc Barsano working to keep the defensive zone clear most of the night, Zakay was there every single time the puck found its way on net. So when the Hurricanes drew another penalty midway through the period, and Morris Bijou found defenseman Sasson with a crossing pass that Sasson deftly tucked past the brilliant HANC goalie, Zakay found himself staked to a commanding 2-goal lead that he was determined to make stand up. With the wind out of HANC’s sails and the Hurricanes clearly on their heels, the Falcon offense, behind tough play from Maleh and Freshman teammate Sam Laniado, amped up the pressure and kept the lion’s share of the play in the HANC zone. The final period was more of the same: Flatbush peppering the HANC goal, the HANC goalie doing everything to keep the game close and the Falcon defense minimizing the time on offense of every HANC possession. The focal point of the period came early as the tension of a 2-goal playoff contest was building to a crescendo, resulting in a flare-up of emotions (what is a hockey game without at least one emotional outburst – with cooler heads prevailing to stem a near player brawl that appeared about to break out after a little too much extra-curricular contact between Falcon Forward Sam Laniado and the HANC goalie who took offense to Laniado’s attempts to stuff home a loose puck in the HANC goal crease). With the play occurring below the overhanging balcony filled to the brim with vociferous Falcon fans, the members of the Flacon’s Nest elevated their cheers to the point that after assessing double minors to both teams, the officials relocated the HANC goalie and defense to the opposite end of the gym. From that point on, the teams played even-Steven, with Elliot Zakay standing tall against a late HANC barrage after pulling their goalie for an extra player in the games waning moments. When the buzzer finally sounded, the Falcons had dispensed with their Long Island guests, quelling the Hurricanes by a final score of 2-0. In the end, Flatbush had everything in place and working, from “A-bie (Cohen) to (Elliot) Z-akay” and all the letters in between! With the victory over HANC, the varsity will move on to a 2nd round playoff matchup with Frisch at Frisch, the site of the Falcons’ early season upset over the favored Cougars. The game is scheduled for Thursday, 2/27, at 8:00 pm. All students interested in riding a fan bus to the game should sign up in the Athletic Office (travel fee of $10.00 required at sign up). The JV Boys Hockey team’s season came to an end earlier in the week with a road loss to TABC by a score of 7-1. The lone bright spot for the Falcons came from the play of rookie Nathan Mosseri. In his first game action in a Falcon uniform, Mosseri tallied the lone goal for the Flatbush JV squad. 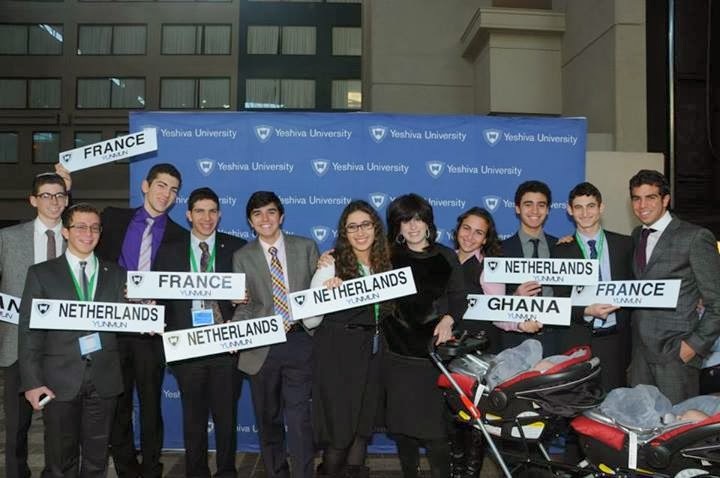 If there were to be one word to describe the Yeshiva University National Model United Nations competition experience, which I along with ten other Yeshivah of Flatbush students participated in, would be: invigorating. 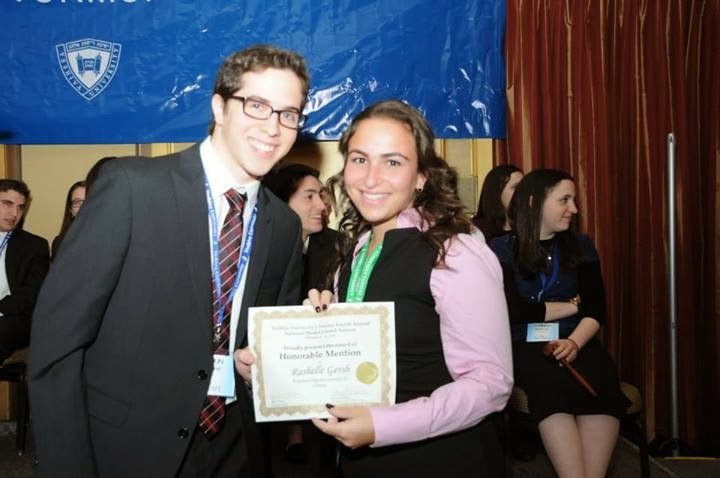 Annually, Yeshiva University hosts a "mock" United Nations at a hotel in Stamford, Connecticut. Schools from all over the world receive roles as delegates representing different countries and students must research assigned topics over a few months and help find resolutions that would be in their countries' best interest as well as others. The ability to practice real life skills by standing up and sharing ideas, constantly adjusting them so that you can incorporate others is not something every high school student can do. 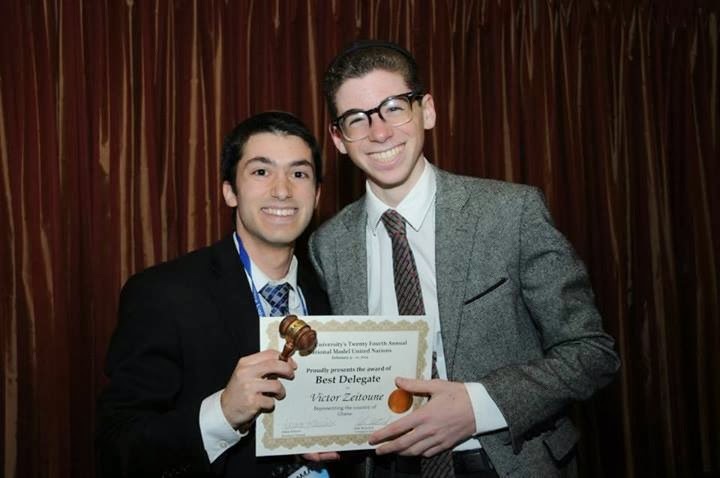 The Yeshivah of Flatbush Model UN team consisted of eleven natural leaders who were able to greatly influence each of their own perspective committee rooms. It not only allows for students to gain real life experience but also interact with YU and Stern students understanding the potential growth a person could have from attending such a college. As high school students, we are aways encouraged to be leaders; yet it is impossible to define leadership in a simple sentence. 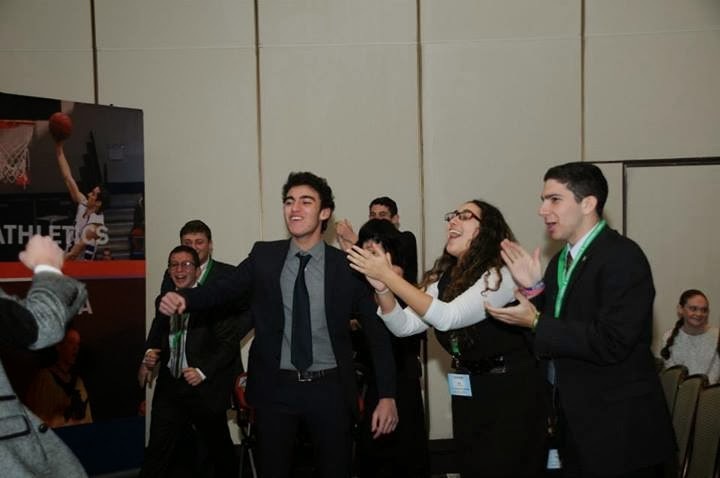 During the three day competition, students first hand experience what leadership is. John Maxwell once said, “A leader is one who knows the way, goes the way, and shows the way.” Students representing countries, in different committees similar to those in the United Nations have the responsibility of working with other students to solve world crises, and passing resolutions. Delegates are also tested on their feet when posed with a crisis in the middle of a 20 hour day that they could not prepare for from before hand. We also had the honor of hearing Rabbi Lord Jonathan Sacks speak. He made a joke while addressing over 400 students from four different countries, “If there are so many leaders, who will the followers be?” As the next generation of leaders in society, especially representing the Jewish people, it is bestowed upon us to use the same tactics used in the Model UN competitions when dealing with real people and real problems. The Yeshivah of Flatbush Model UN team was able to bring home awards thanks to our amazing captains, Joy Feinberg and Michael Bildirichi, and dedicated faculty advisor, Mrs. Rina Zerykier. Receiving Best Delegate awards, veterans, Charles Chakkalo and Victor Zeitoune and Honorable Mentions, veteran Joy Feinberg and rookie Rashelle Gersh. If you thought the first match-up between Flatbush and Magen David was a classic, then the rematch can only be called one for the ages. With their seasons’ on the line, the cross-borough rivals took to the court at Flatbush for the second time in a little over a week, this time with the winner advancing to the quarter-final round of the MYHSAL playoffs – and the loser going home. It proved to be a game in which the regulation 32 minutes would not be enough to determine a winner. An overtime period would be required, and that extra stanza would provide the home Falcons the additional four minutes it would need to secure a two-point victory, 51-49, and a re-match with Heschel in Manhattan. But, the fact that there would even be the prospect of overtime seemed an enormous reach based on the first 38 minutes and 30 seconds of play. Before the start of the contest, the stands were a sea of gold, as the Falcon’s Nest was ablaze with “Rock the Nest!” rally towels! The giveaway to the Flatbush faithful was the brainchild of Sophomore JV Co-Captain Albert Richter. And while he was hoping to have them on hand for the JV playoff opener later this week, the mailman had a surprise, and they arrived just in time for the Varsity game. With the fans slowly filing in, the starters for both teams were introduced to cheers from their respective supporters, and again the crowd rose with respect as Flatbush student Janet Chrem hit all the big notes in the Star-Spangled Banner and Hatikvah. With the preliminaries properly dispensed with, it was time for the players to take center stage. Right from the opening tip, it was clear that both teams came in with a define game plan. Flatbush elected to start a “small” squad, but one that comprised the best outside shooters statistically on the season. Along with its pressure defense, the Falcons hoped to take advantage of the soft spots it found in the MDY defense last time around. To counter, MDY went tall, electing to pack in the zone and play to their height advantage while hoping to minimize the fouls that piled up the previous outing that ultimately led to their late downfall in the Sackin Classic. It was a defense that challenged the Falcons to beat them from the outside – far outside. From the outset, defense reigned supreme. For nearly two and one-half minutes, the teams sized each other up, exchanging possessions with neither team able to register a point and with the Falcons surprisingly controlling the rebounds, until Michael Haddad got the Falcons on the board with a 3-pointer from deep in the corner that brought the first ripple of cheers from the Flatbush faithful seated behind him. Again, the defenses played tough, and while Flatbush enjoyed a number of good looks at the basket, they could not capitalize, and at the halfway point of the first quarter, the Warriors tallied the equalizer from outside. In fact, Flatbush could only convert on one of its first seven shots, all virtually uncontested from the outside. The Falcons could only muster one more basket in the quarter, and they found themselves trailing the Warriors 7-5 at the close of the opening stanza. It was clear at least on the offensive end that Flatbush was feeling the pressure of being the favorites, and that MDY appeared to have a loosey-goosey attitude, playing with a level of comfort and ease that often goes hand-in-hand with the underdog label. By this point, the stands were filled to capacity, with spillover into both corners and in the balcony above. As good as the defenses were in quarter one, the intensity was amped up even more, with both teams feeding off the energy of the crowd. And, it was a knowledgeable crowd. The fans of both teams exalted with each basket made by their side, recognizing that each possession was precious, that the referees were letting the players play (not a great amount of fouls called overall) and that each basket was key in a game that looked to be a low-scoring contest. With both coaches rotating players in to keep the pressure on and the legs fresh, the two squads played even in quarter two, and the teams went into the half with Magen David holding on their precarious lead by a score of 18-16. A hallmark of the Falcons Boys Varsity season has been the squad’s ownership of the third quarter. From the pre-season games and onward, the Flatbush Boys have shown a propensity for digesting what their opponent presents in the first half, and exploiting it in the second half. But that stalwart aspect deserted the Falcons here. At the start of half number two, the Warriors quickly ripped off two straight baskets while the Falcons came up empty on their opening possessions. In fact, the Falcons “O” was stone cold. All the while, the Magen David offense showed patience, and began knocking down “3’s” slowly building a comfortable cushion, while the Flatbush five could not buy a long range basket. In a period the Falcons have owned all season, their offense deserted them. For the period, all Flatbush could muster was a Joey Dweck mid-range jumper and three free-throws; one from Joey Dayon and a pair from Nathan Haddad. When the dust had settled, the Warriors outscored the Falcons by a score of 14-5, and found themselves staked to a nearly insurmountable 11-point lead at the end of three quarters of play. One thing a follower of this year’s edition of the Varsity Falcon Boys Basketballers would surely know is that no matter what the outlook, this team never thinks it is out of it. Every one of the 15 players on the roster truly believes that if there is time on the clock, Flatbush can win. True to form, the Falcon’s opening possessions of the final quarter netted a traditional 3 point play from Nathan Haddad and a 2-point basket from Murray Mizrahi. MDY responded with a two of their own to push the cushion back to 8. And while the Falcons amped up the pressure again on defense, they just could not close the gap and get over the hump. For all their confidence and their never-say-die attitude, the Falcons looked dead and buried. Maybe it is inner fortitude, maybe it is enormous heart or maybe it is an internalization of the lessons learned from playing in three early-season tournaments, but these Falcons just refused to believe their season was about to end. And neither did their fans! With chants from the crowd of “F-L-A-T Bush, Bush, Bush!” the home supporters were Rockin’ the Nest, waving their Richter rally towels, urging their “Boys” to find a way. True to form, they did just that. With a mere 2:30 left to their season, the Falcons rose up behind clutch long-range shooting. Recognizing a change in the defense, Senior Joey Dayon saw and opening, elevated and drained a three right in front of the Magen David fans. Following a defensive stop, Buddy Setton, uncharacteristically cold all night, finally found the bottom of the net hitting a three of his own. With the defense holding yet again, the ball found its way to Joey Dweck and he, too, drilled a three from in front of the Falcon bench bringing his teammates – and the Falcon faithful in the stands – to their feet. With 1:38 now left on the clock and the Warriors calling for time, the Falcons had climbed all the way back to tie the score at 43-all! In the blink of an eye, the momentum had swung a complete 180 degrees, and the weight that seemed to hold the Falcons down all night had clearly shifted to the backs of the Warrior players. With yet another defensive stop, the Falcons now had the ball with a little over a minute to play. Working the weave, the Falcons looked to hold the ball for the final shot, and the Warriors were content to let the game rest on the success or failure of that shot. With 10 seconds to play Nathan Haddad worked towards the hoop, saw a seam, penetrated and elevated – and looked to have been fouled. But, no call came from the officials. Murray Mizrahi pounced on the loose ball and directed it towards the basket as the buzzer sounded, but it bounced off the rim and at the end of regulation the score stood 43-43. Murray Mizrahi and the fans go wild after the Falcons tie the score at 43! OVERTIME! With a renewed confidence, the Falcons took the court for an additional four-minute period to decide who would move on, and who would go home. And, once again, the teams both ratcheted up the defense. And it was the defensive end that would find Senior Co-Captain Michael Shalom at the center of what turned out to be the play of the game. With the score still tied and 1:30 to play, Magen David’s big center Aaron Harari took the ball near the Warrior bench, put his head down and headed towards the basket for the go-ahead hoop. But Shalom read the play from the opposite side of the court. He quickly stepped in to the lane, established position, and took the full brunt of the drive from Harari. The referee’s whistle sounded, and with both players lying on the floor in a heap the official signaled a charging foul on Harari. Shalom popped up, his fist pumping, and the Flatbush faithful rocking! With the ensuing possession, the offense worked the ball and when it got to Joey Dweck, he calmly drained a mid-range jumper. At the 1:10 mark of overtime, Flatbush had its first lead of the game since they led 3-0 early in the first quarter! With both teams in the bonus, Magen David was fouled and went to the line to shoot free throws. They missed both. Murray Mizrahi came down with the huge rebound, was fouled and drained both to put Flatbush up by four with under a minute to play. The ensuing possession saw a Warrior drive the baseline and hit the basket while also drawing a foul. The made free-throw cut the lead to one. Buddy Setton then went to the line, hitting one of two to push the margin back up to two with 21.6 seconds left on the clock. The tension in the gym was palpable, and the floorboards reverberated with the Flatbush faithful’s exhortation of “De-Fense, De-Fense!” And once again, the defense stepped up. Buddy Setton corralled the missed Magen David shot, hit Nathan Haddad with the outlet who was then immediately fouled. With the Magen fans screaming at the tops of their lungs, Haddad calmly sank both shots to put Flatbush up 50-46. After another MDY miss, Joey Dweck grabbed the rebound, and hit one of two from the charity stripe. In a last-ditch effort to come back Magen David sank a deep 3-pointer to close the gap to 2, but only 1.0 second remained after calling their final time-out. Flatbush successfully inbounded the ball, the buzzer sounded, and there was pandemonium on the home floor! The Falcons had come all the way back from the netherworld to record a shocking 51-49 victory, and advanced to the quarter-finals of the MYHSAL playoffs. With the victory, the Falcon Varsity will travel to Manhattan for a quarter-final match-up with the Heschel School. Heschel defeated the Falcons in their one meeting earlier this season, in Brooklyn. Due to inclement weather, the JV Boys Basketball playoff opener scheduled for Thursday, 2/13, has been postponed. The JV team will open the playoffs next Thursday, 2/20, with an 8:00 pm tip-off against yeshiva Rambam. Once again, rally towels will be handed out to all Flatbush students in attendance. GO FALCONS! Students Learn That Healthy Food Can Be Delicious Too! 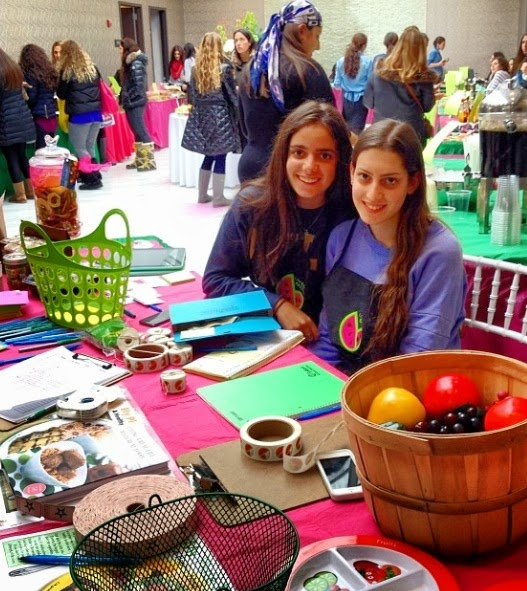 Last week a few Yeshivah of Flatbush students had the opportunity to attend the book launch for Beth Warren's new recipe book, Living a Real Life with Real Food. This was an amazing and fun opportunity for students to learn about healthy foods through our Pathfinders Program. As volunteers, the students helped set up the hall and sell products. They also had the pleasure of sampling different foods that were health and delicious! As one student said they learned that, "Yummy food can be healthy too!" Starting with Girls Volleyball and ending with Girls Basketball, with Boys Basketball sandwiched in between, the Flatbush Falcons Fall/Winter regular season home schedule came to a close with three exciting match-ups that would send our graduating senior student-athletes off with great fanfare. Varsity Girls Volleyball got Senior Week off to a big start as they hosted MYHSAL -leading and undefeated- Central Yeshiva University HS for Girls. Before the game, Head Coach Evelyn Shterenzer presented each of her graduating seniors with a special jacket, emblazoned with each player’s name and number on the front, and a crowned volleyball on the back containing the name of every senior player on the team. Of the token, Senior Co-Captain Renee Sutton had this to say: “I was shocked! It was so nice! No one has ever done anything like that for us before.” Co-Captain Danielle Shalam added, “I LOOOVE it! What a great feeling! 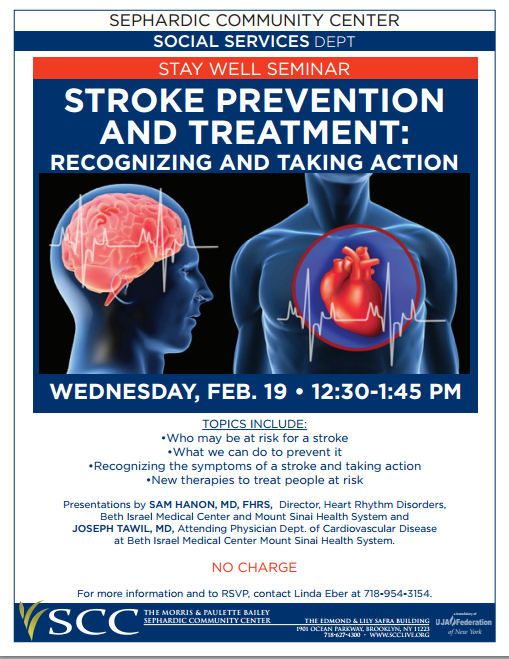 It shows that we really accomplished something!” The presentation was followed by outstanding renditions of the Star-Spangled Banner & Hatikvah from Flatbush Choir member and fellow student-athlete Merle Cohen. With the energy high and the players primed and ready, the Falcon servers took the game right to their top-ranked opponents. From top to bottom, the entire rotation consistently dropped in their serves with multiple runs of points recorded by Eileen Sutton, Danielle Shalam , Celia Tawil and Renee Sutton. Throughout the contest, Central displayed exactly why they are the top team in the League, digging out tough serves, making crisp passes and looking to place their returns. But the Falcons definitely came to play. Solid serving staked Flatbush to an early lead, and with quality returns, they kept the pressure on. And, for the first time all season, the Falcons appeared to play above the net, making deft passes and even dropping a spike in the central defense. When the dust settled, the Falcons were first to 25, outscoring Central by 4 points to take a 1-0 lead in the match. Game two started out in similar fashion, with Eileen Setton staking the home squad to an early 5-0 lead. There was a palpable energy in the Falcon’s Nest! The crowd – unaccustomed to the tennis-like rules of etiquette demanding quite prior to each serve – needed to be calmed by the referee, and the Central coach was noticeably shaken. But as quickly as the lead was built, the Falcons gave it right back, equally unable to break the Central ace’s serves, and the game was soon knotted at 6-6. At that point, the momentum swing was on in full. Central maintained a consistency throughout the match, but Flatbush’s serving began to falter. With unforced service errors, the Falcons soon fell behind, and could not overcome the deficit, falling in game 2 by a score of 25-19. The rest of the match followed the same format, with Flatbush jumping out to an early lead, only to find Central scratch back into the game, eventually taking the lead. In an effort to stem the tide, Coach Shterenzer inserted diminutive setter Rochelle Tawil. With power belying her size, Tawil ripped off consecutive serves while also digging out tough returns, energizing the home squad and rejuvenating the Falcon netters. Flatbush closed the gap, but could not get over the hump and fell in game three, 25-20. Game four looked to be more of the same – early falcon lead, mid-game Central rally and a Falcon fade to close out the game. But the Falcons proved resilient. With offense-defense substitutions (Lorraine Shamie and Becky Waldman on to solidly return serves coupled with Celia Tawil for power serving), the Falcons slowly scratched at the Central lead. With the crownd rocking the Falcon’s Nest, Celia Tawil took over service. With the pressure on, Tawil rose up and ripped off three consecutive serves, bringing the Falcons to the brink of pushing the match to a fifth and deciding game. But it was not to be. Tied at 23, Central successfully took back position, and with a one point lead, served out the match, sealing the game 25-23 and taking the contest three games to one. A disappointing loss, but a definite moral victory in that the Falcons, now 6-4 (all 4 losses came to the division leading Central and SKA squads) and headed for a first round play-off match at Ma’ayanot, stood toe-to-toe with the League leaders and nearly pulled off the upset of the season! Next up were the Boys Varsity Basketball Seniors. With two-thirds of this year’s team made up of seniors, Tuesday (2/4/14) nights pre-game ceremonies were certain to be emotional, and longer than most. After speeches from Co-Captains Nathan Haddad and Michael Shalom, in which they recounted the positive experience of playing four years in a Flatbush Falcons basketball uniform, and citing how much they have gown as players and people from the experience, Head Coach Avi Borenstein presented each senior with a personalized plaque and team photo to remember their time as a Falcon hoopster. 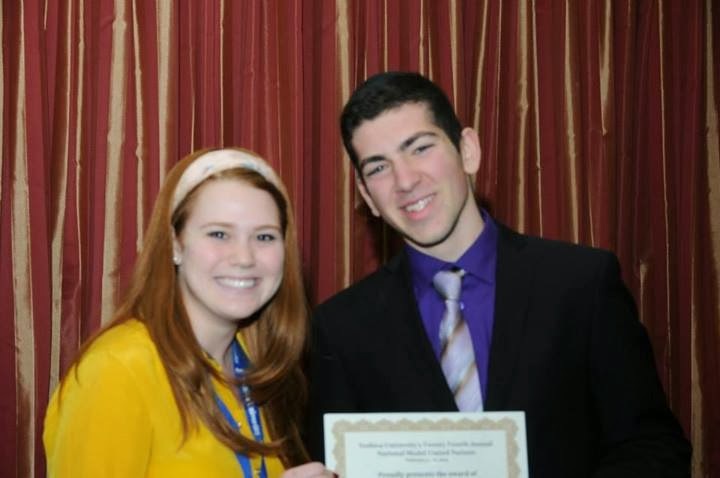 Senior Murray Mizrahi reflected, “It was so nice. I can’t remember the team ever doing this before [on Senior Night]!” Following player introductions, Aida Franco (accompanied by Flatbush Choirmaster Brian Gelfand) gave a jaw-dropping performance of the Star-Spangled Banner & Hatikvah. With the ceremonies completed, the game took center stage. With a starting line-up of seniors Victor Silverman, Aaron Harari, Shawn Blinder and Co-Captains Michael Shalom and Nathan Haddad, the ball was up and the game was on. Blinder controlled the tip, and for four minutes, the Falcons and the guests from HANC played even-steven. At that point, Coach Borenstein inserted the two Joey’s – Dayon & Dweck – along with Murray Mizrahi, and the Falcons went on an offensive spurt that staked the team to a lead they would never relinquish. With added scoring punch from reserve Senior Guard Michael Haddad and a strong rebounding presence provided by Mizrahi, Blinder and Silverman, the Falcons built on their lead. Coach Borenstein utilized nearly the entire bench in the first half, a stalwart strength of the team all season, in building the lead to double-digits at the half. The second half saw complacency set in, which is not a good thing for a team that relies in intensity as the key ingredient for success. As a result, the Falcons lost some of their rhythm and became lax in their offensive execution. The lack of efficiency by the Falcons began to give the guests from HANC some confidence. As a result, the Hurricanes began whittling away at the Flatbush lead. Late in the contest, HANC closed the gap, making it a two-possession game with less than one minute to play. With the clock winding down, HANC put the Flatbush Varsity hoopsters on the foul line in a last-ditch effort to push past the Falcons and tarnish Senior Night. But, the Falcons took what was an early season weakness and showed that it is now a strength. On successive possessions, Joey Dayon and Murray Mizrahi went to the charity stripe and calmly knocked down key free throws to ice the game, and send the Seniors, their teammates and the Flatbush faithful home with a 55-50 victory. Brothers on defense for Flatbush! Nathan Haddad on the move! The following night, the Falcon Varsity Girls welcomed a different set of Hurricanes, these ones making the trip north through the frozen slush from Hillel Yeshiva in Deal, NJ. In following the scene set by their male counterparts, the Senior Varsity Girls basketballers were sent off with a grand ceremony in their final home game of their high school careers (the playoffs will be on the road for theses Falcons, only the opponent is yet to be determined). Opening with words of praise for their accomplishments offered by Head Coach Rozan Mizrahi, Senior Co-Captains Alison Kassin and Rachel Linfield followed with memories of their own from their respective long and short histories as Falcon Basketball players. Like the boys, the Senior girls were presented with a personalized plaque and team picture. About the gift afterwards, Senior Co-Captain Alison Kassin offered, “This is so nice! I love it!” To close out the ceremonies, following introductions of both team’s starters, Merle Cohen stepped from the team bench and gave a grand performance of the national anthems of the USA and Israel. With the preliminaries properly dispensed, it was time for the final tip of the home season. Merle Cohen sings, and the team joins in! For the first time, Coach Mizrahi placed her five seniors on the court for the opening tip. Co-Captain Alison Kassin stepped into the circle surrounded by her fellow Seniors: Lauren Berkovits, Robyn Saad, Jackie Baum and Co-Captain Rachel Linfield. The Flatbush girls were sharp on defense, denying their guests from Deal, but could not capitalize on the offensive end. After a short time with neither team taking control, Coach Mizrahi inserted Junior Center Merle Cohen and Sophomore Guard Victoria Gindi, and the Falcon offense started to mesh. Moving the ball with crisp control, the Falcons created open lanes and started finding clear paths to the basket. And, with Cohen anchoring the defense, the Hurricanes could not find an open look inside. Slowly the Falcons built a small cushion. Late in the first half, the Falcons really found their groove. Looking like the Energizer Bunny, reserve Guard Rose Mishaan gave a jolt of energy to her teammates. And, along with Jennifer Maleh, the Falcons caused the Hillel 5 to commit turnover after turnover, converting the fast break opportunities into Falcon points. The second half brought more of the same. It was like watching the passing of a torch from the old to the young. With Kassin and Linfield providing the leadership, they created scoring opportunities for their Sophomore teammates, giving the Falcon fans a glimpse of what they can expect next season as Gindi, Maleh and Mishaan, alongside Junior Merle Cohen, will be the mainstays of the Flabush attack in 2014-15. But for all the scoring punch provided by the Falcon neophytes, the game was controlled by the suffocating Flatbush defense, a key element in every Falcon win this season. When the final buzzer sounded, the Falcons stood tall, with a 33-21 victory for their efforts. Rose Mishaan swats away the pass! The scoreboard tells it all! Due to a snow out last Monday (2/3/14), the Boys actually closed out their home season on Saturday night (2/8/14) with a tough loss to HAFTR, ranked 4th nationally amongst Yeshiva schools. After trailing by double-digits at the half, the Falcons never quit and “won” the second half, falling to the Hawks by a score of 52-43. The team was lead in scoring by the Haddad brothers; 16 for Nathan and 8 for Michael. The Flatbush Girls JV Basketball team also had a rescheduled date with HAFTR to close out their regular season due to snow last Monday. The girls travelled to Long Island and avenged an earlier loss by eking out a 5 point victory over the host Hawks, 39-34. The win completes a 5-5 regular season for the JV Falcons. On the night, the team was led in scoring by Sarah Horowitz who tallied 23 points, a career high for the Flatbush rookie. With the win, the Falcons will draw the Ma’ayanot Rapids as their first round opponent in the MYHSAL playoffs; the game is scheduled for Thursday, 2/20, at 8:00 pm. While we must wait to learn where the Flatbush Girls Varsity Basketball team will be travelling to for their opening round playoff games, the Flatbush Boys will held their 1st round playoff games this week. The Varsity Boys opened the postseason with a rematch win of the Sackin Classic, hosting rival Magen David Yeshiva on Tuesday, 2/11. The JV boys, top seed in the Brooklyn Division by virtue of their 10-0 record in division will host Yeshiva Rambam on Thursday, 2/13. Weather permitting, the game will tip-off at 8:15 pm. The Flatbush Varsity Girls Volleyball team will be travelling to Ma’ayanot Yeshiva in New Jersey for their first round playoff match with the top-seeded Rapids. The game is scheduled for Wednesday, 2/19, at 7:00 pm. The Flatbush Hockey program is also gearing up for the playoffs. The JV team will be travelling to New Jersey to take on TABC (date and time TBA). The Varsity will be hosting HANC (also, date and time TBA). Please note that this game will also double as Senior Night for the Flatbush Hockey program. Come out and support your hometown Flatbush athletes in the MYHSAL playoffs. GO FALCONS!